CINCINNATI -- More than a few eyebrows raised when it was announced that the 99th Findlay Market Opening Day Parade would not actually take place on Opening Day. But with the Reds’ having to postpone Thursday’s scheduled opener , then being shut out Friday, maybe parade organizers knew what they were doing. Besides its not-really-Opening-Day date, however, the parade will look a lot like its traditional self, with 187 units marching at noon Monday from Ohio’s oldest surviving municipal market building down Race Street to the heart of the city and across Fifth Street. (For more details about the parade, visit its website .) With the weather expected mostly to cooperate, the key to a fun time will be staking out a prime viewing spot – and a prime parking spot. We thought we’d offer some help. If your normal routine doesn’t include trips downtown, getting there and finding parking will be your biggest challenges. The best single piece of advice is to leave early. On the roads, the barrel-slalom course on I-75 in Ohio has moved north from previous years, but it’s just as fun as ever. Though work on the Martin Luther King Drive interchange with I-71 is finished, it’s not quite clear sailing from that direction, either. If you’re headed up from Northern Kentucky, I-75 remains a challenge, and there’s also the added closure of the Roebling Suspension Bridge due to damage from an accident . Downtown construction has subsided from last year, but there’s always some work going on. A great tool to help you plan ahead is Roadmap Cincy , which maps detours and lane restrictions in Downtown and Over-the-Rhine. Once you get to town, parking will be tight. Remember: For most folks, it’s still a regular work day, so those workers will take their regular spots. Heading north of Central Parkway has potential, but expect parade participants, workers and staffers to use most of the parking around Findlay Market proper – assuming you can even get to those streets in time. Several blocks of streets near the market will close to traffic at 8 a.m. Monday. If you’re trying to snag a spot along a street, remember that not all meters are created equal. Parking rates range from $1 to $2.50 per hour (that’s up a little ), and most have just a two-hour limit (see the map below). The city has given smartphone users a secret weapon to make this a more practical option, though: Cincy EZPark . The app, available for Apple’s iOS and Google’s Android , lets users track and add time to their meters from their phones. No more hiking back to the car to feed in quarters. If you would prefer a parking lot or garage, there are many options, but be prepared for special event rates and maybe even waits at garage gates. 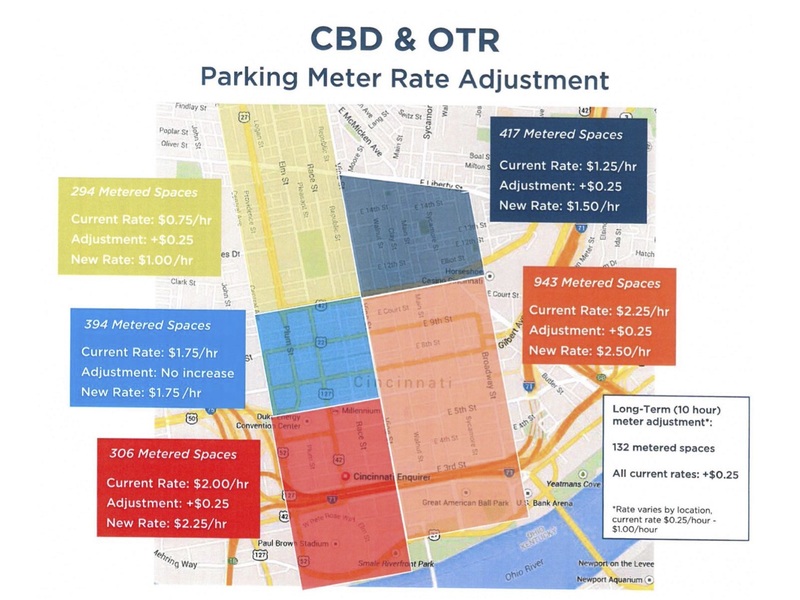 Cincinnati Parking Finder offers a guide to and estimated costs of many Downtown parking sites, particularly surface lots. There are deals if you’re willing to walk several blocks. Once you’ve parked, you’ll have to decide where to get the best view. Fortunately, two of Cincinnati’s best public spaces, Fountain Square and Washington Park , are again turning into hubs of entertainment for the day. They will offer food, drinks (MadTree Brewing will sponsor the Square’s rally; Taft’s Ale House will host Washington Park’s), live music and family fun through the day. What if you’re happy just staking a claim to a square of sidewalk? That’s fine, but while you’re waiting to see parade grand marshals Danny Graves and Sam LeCure ride by, you might want a snack … or need a bathroom or to reload your wallet. We’ve got you covered with the interactive map below. It offers helpful sites to make your Opening Day experience as smooth as possible. It’s not meant to be encyclopedic: It includes hardly any sit-down restaurants, for example. You’ll have more fun discovering those on your own. Along Vine Street in Over-the-Rhine, you can find everything from sushi and gourmet hot dogs to barbecue and Belgian waffles. OTR’s redevelopment has reached the blocks around Findlay Market, too. Close by are Eli’s BBQ, French Crust Cafe, Harvest Pizzeria; more specialty restaurants have popped up along 15th Street, close to Taft’s Ale House. There are road closures (scroll down for a list) and parking options you might not have known about. There also are easy-access retailers that can supply your parade-watching needs and quick-service eateries to quiet a rumbling belly. The two big public spaces along the route, Fountain Square and Washington Park, have public restrooms. And don’t forget: There will be plenty of street vendors out, too, with bottles of water and snacks at the ready. You’re armed with technology, knowledge and fan enthusiasm. Go forth and parade. Follow Thomas Consolo on Twitter: @tconsolo_news . Map instructions: Click on the gray, square legend button in the top left corner to select what information you would like to display on the map. Use the +/- buttons in the bottom right to zoom. Note: There will be a lot of folks clicking on the map Monday morning; if you have trouble getting it to load, please try refreshing your page or clicking here . Race Street: between Liberty and McMicken streets. Elm Street: between Liberty and McMicken streets. Findlay Street: between Central Parkway and Vine Street. Elder Street: between Central Parkway and Vine Street. Green Street: between Vine and Logan streets. Henry Street: between Race and Dunlap streets. Dunlap Street: between Findlay and McMicken streets. Logan Street: between Liberty and Findlay streets. Liberty Street: between Vine Street and Central Parkway. Central Parkway: between Vine and Elm streets. Race Street: between Liberty and Fourth streets. Fifth Street: between Elm and Sentinel streets. Fifteenth Street: between Republic and Elm streets. Fourteenth Street: between Elm and Republic streets. Thirteenth Street: between Race and Vine streets. Twelfth Street: between Elm and Vine streets. Court Street: between Elm and Vine streets. Ninth Street: between Elm and Vine streets. Eighth Street: between Elm and Vine streets. Seventh Street: between Elm and Vine streets. Sixth Street: between Elm and Vine streets. Vine Street: between Fourth and Sixth streets. Walnut Street: between Fourth and Sixth streets. Main Street: between Fourth and Sixth streets. Sycamore Street: between Fourth and Sixth streets. Broadway: between Fourth and Sixth streets.